BetShare is a free service, designed to bring you winning bets every day of the week. We have a team of tipsters who provide their hot picks on a daily basis. They do the hard work so you don't have to! We won't share your information with any third parties without your permission. Along with the team at BetShare who are on hand with advice and support most of the time, we have a network of tipsters there to answer your questions and to help with your bets. You can access BetShare from anywhere at any time. Our new mobile friendly website means that whenever you have an internet connection you can access BetShare, whether it is using a mobile phone, a tablet or a desktop computer. Everything we do is geared towards beating the bookies - but whatever the outcome we are in this together! We run three dedicated services – TwitterNAPs, FootieNAPs and now PuntersNAPs – for fans of horse racing, football and general sporting tips respectively. Each brings together some of Twitter's best tipsters, sharing their winners and ranking their monthly performances, making it easy for you to see who is in form and who is the most consistent. Use their tips to win money! 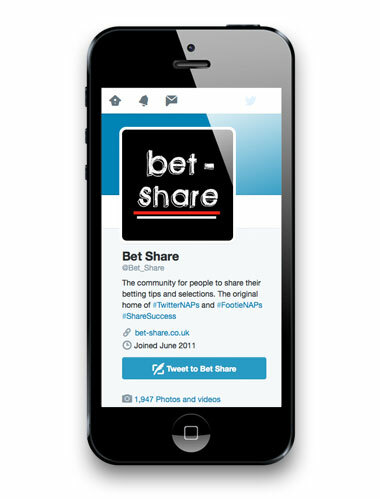 BetShare, as our name suggests, is also a community for all punters. Got a hot tip, a piece of vital insider information or a new system that can’t fail? Share it through @Bet_Share on our Twitter feed. Simple, immediate and effective. It’s what we are all about. With more than 40,000 followers, including some of the country's top tipsters, we are one of the biggest online betting communities. Get involved! Unless the tipsters have lied about their ages.